7 Kids and Us: Barnies Coffee Single Serve Now Available at Publix! Barnies Coffee Single Serve Now Available at Publix! I am so in love with Barnie's Coffee. If you haven't ever tried "Barnie's White Christmas" you MUST. Even if it isn't the Holidays, this coffee is SO good! Introduced as a holiday coffee in 1995, it soon became a year-round best seller. Flavored with coconut, nuts, sweet caramel and vanilla, it remains unforgettable. Compatible with Keurig® original K-Cup® coffeemakers. Keurig® and K-Cup® are registered trademarks of Keurig, INC. 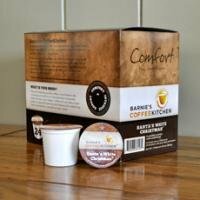 Neither Single Cup Coffee, Ltd. nor Barnie's CoffeeKitchen® are affiliated in any way with Keurig, Inc.
Now, you can purchase Barnie's Coffee in either single serve boxes, or bags of ground coffee. I recently had the chance to sample a couple of the flavors in the single serve (I love my Keurig!). My favorite is the Cafe Au Chocolat. It's like a smooth mocha when I combine it with some fresh cream and sugar. Perfect for mornings getting ready to start my day of home schooling. I love they have the singles I just got a coffee maker and wanna try many different flavors now.